By early in 1950 General Vo Nguyen Giap had built up his forces in the Bac Viet to five divisions. By later that year, after the monsoon season had passed, his newly strengthened Vietminh Army was poised and ready to attack and defeat the French along a rural stretch of road dotted by forts running between Lang Son, Dong Khe, and Cao Bang. The General’s objective was to clear French forces from the area north of Hanoi near the border with China. In 1949 the Chinese border became a sanctuary for Vietminh operations. With the rise to power of the Communists over Chiang Kai-shek, Ho Chi Minh and Vo Nguyen Giap suddenly had training camps and safe harbor across the border in China. In addition to the strategic depth provided by the Chinese, Chairman Mao tossed in tactical and material support and sent seasoned officers as military mentors and trainers. By fall, Giap saw that he had an opportunity for a quick decisive win against the complacent French defenders– his target was a string of isolated French outposts along Route Colonial 4. The French had taken the road in Operation LEA back in 1947. The captured territory had been held ever since by troops stationed in a series of garrisons erected at intervals along the road. By the onset of monsoon season in 1950 (roughly late April) the French had ceased supplying their fort at Cao Bang by truck (air drops only). 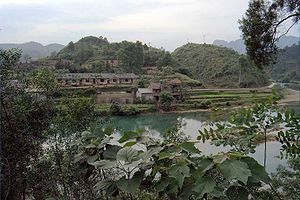 They had also evacuated several of their other RC4 outposts leaving only the Dong Khe and Cao Bang positions inland from Lang Son (where RD1 linked up from Hanoi). Giap’s first target was Dong Khe, the middle of the three posts, where Moroccan troops manning the garrison were attacked from the jagged Karst Mountains above by Vietminh forces using American-made 75 mm pack howitzers. The Moroccans were beaten soundly, relatively few escaped. The French counterattacked quickly by dropping a parachute battalion right into the reeling position. Then the paras pounded the Vietminh, driving them back into the jungle. It proved to be a temporary respite. While all of this planning was going on Dong Khe was being attacked a second time and this time the paras were overrun (only a handful made it out alive). Now the Vietminh would concentrate exclusively on smashing the BAYARD expedition and the Cao Bang retreat. Commanding the fleeing Cao Bang group south was Colonel Charton. Leading the BAYARD expedition north was Lieutenant Colonel Marcel Lepage. BAYARD was a disaster in logistics and execution from the get-go. To start, Carpentier, for some reason, didn’t tell his BAYARD commander Lepage any specifics about his mission! Finally, belatedly, Carpentier ordered BAYARD to move-out up RC 4 to link up with Charton. The element of speed and surprise had been lost and had actually now turned into a liability because, little did Carpentier and Lepage suspect, they would be up against two Vietminh regiments with more on the way from the Chinese bases, they couldn’t outnumber or outrun them. It didn’t take long for the BAYARD forces to be stopped dead in their tracks. Soon after, ambushed and harassed, Charton’s men were forced to leave the road and cut through many miles of the jungle with machetes. Lepage and his charges eventually fought their way into a real jam– they were sealed off and trapped in a limestone gorge called Cocxa, there they were annihilated. It’s interesting to consider that at this same time, sixteen hundred miles to the north, the US Marines had taken Inchon and were fighting for Seoul in S. Korea and the 8th Army was slugging its way north toward Pyongyang and a showdown with the Chinese armies at the Yalu River. This was an important fall season as far as Cold War history is concerened. Through it all, somehow, the Cao Bang squad under Charton was able to repel repeated Viet Minh attacks and miraculously many made it out alive. The rest of the French Expeditionary Force on the other hand was either on the run or wiped out altogether; eight battalions were destroyed, half of them elite Foreign Legion and parachute troops. French Expeditionary forces lost some 7,000 men and over 3,000 tons of weapons. And even though the human and material losses were demoralizing, it may have been the psychological defeat that resonated even further. Noted Historian Bernard Fall called it the worst French colonial defeat since the failure of Montcalm nearly two hundred years earlier on the Plains of Abraham at the Battle of Quebec (1759). In the shadow of Giap’s stunning victories along Route Colonial 4 in 1950 the French were in disarray and fearing for their safety and colony. They were making plans to evacuate as many colonists as possible from North Vietnam. Panic was in the air. They responded by sending in a new commander-in-chief, a general of higher caliber than the hapless Carpentier, his name was General Jean de Lattre de Tassigny. De Lattre then built a series of pill-box strongholds around the Red River Delta for defensive and morale purposes (the de Lattre Line). The French dug in. In the wake of his triumphs General Giap was overly confident, too confident as it turned out, in his army’s ability to capitalize on it’s momentum. The General readied his forces and strategy for an upgrade to phase three conventional warfare. He mistakenly thought the French were ready to fall. He was wrong. He launched a series of over-optimistic attacks on the French perimeter around the Red River Delta which he called his General Counter Offensive in spring 1951. These attacks were expensive failures for the Vietnamese. Large Vietminh infantry units and onrushing human waves were caught in the open and mowed down by French napalm. As a result, Giap failed to take the Delta and his army suffered heavy losses. But to his everlasting credit he learned and adapted, adopting less ambitious tactics in the following years. From then on he adhered strictly to Mao’s military concept of fighting a war of time, distance and will. It would serve him well for decades to come.